Video: No Chemical Weapons Used by Assad in Syria? Reality Check. It was a stunning announcement, stunning because of what was said and maybe equally as stunning because it was honest. Secretary of Defense James Mattis says there is no evidence that the Syrian government used sarin gas on its own people. It is a narrative we have been pushing back on for years. So what does this mean for U.S. policy in Syria? And will President Trump continue to push for war in Syria, or will he return to the positions of candidate Trump who said the U.S. should stay out of it? The statement is getting very little media coverage but it is a very big deal. According to Defense Secretary James Mattis, there is no evidence that the Syrian government has used sarin gas on its own people. Mattis insists that he wasn’t refuting the claims. But in a sense, he did. According to Newsweek, in 2017 a White House memorandum was quickly produced and then declassified to justify an American Tomahawk missile strike against the Shayrat airbase in Syria. The justification used was that Assad had used chemical weapons on his own people. Then President Trump himself insisted that there was no doubt that Syrian President Assad had killed his own people with banned chemical weapons. But Mattis also didn’t qualify the statement to just the Syrian airbase strike. That means that the 2013 gas attack in Ghouta also was not proven to be Assad. At that time, President Obama and Secretary of State John Kerry were demanding congress approve use of force against Assad. Obama said this from the rose garden as he said American destroyers armed with Tomahawk missiles were on standby in the Mediterranean Sea. Congress did not approve that use of force, but then applauded Trump for his use. For his part, in this latest statement, Mattis says that “aid groups and others” had provided evidence of the Syrian government using sarin. But as I have extensively reported over the past few years, there is much evidence that the so called Syrian freedom fighters are actually ISIS and Al Qaeda fighters. And there is evidence that they have used chemical weapons. Other problems with the claims of Assad using sarin: in the 2013 Ghouta event, the sarin came from home-made rockets, which were favored by insurgents. “In the 2013 event, the White House memorandum seemed to rely heavily on testimony from the Syrian white helmets who were filmed at the scene having contact with supposed sarin-tainted casualties and not suffering any ill effects. “Carla del Ponte, head of the independent UN commission investigating reports of chemical weapons use in Syria, told a Swiss-Italian television station that UN investigators gleaned testimony from victims of Syria’s civil war and medical staff which indicated that rebel forces used sarin gas – a deadly nerve agent. 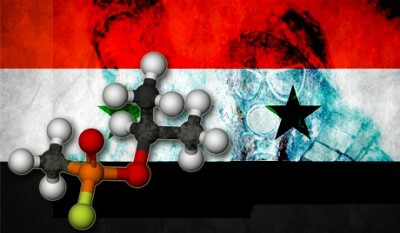 “‘Our investigators have been in neighboring countries interviewing victims, doctors and field hospitals and, according to their report of last week which I have seen, there are strong, concrete suspicions but not yet incontrovertible proof of the use of sarin gas, from the way the victims were treated,’ del Ponte said in the interview, translated by Reuters. It was the involvement of those jihadis posing as Syrian rebels that made then-candidate Trump state emphatically that he wouldn’t intervene and help oust Assad as Hillary Clinton wanted to do. Candidate Trump pushed back heavily against intervention. He warned that ISIS was likely to take over Syria if Assad were ousted, just as they have in Iraq and Libya. And yet the U.S. is only escalating fighting. Four Russian nationals, and perhaps dozens more, were killed in fighting between pro-government forces in eastern Syria and members of the United States-led coalition fighting the Islamic State, according to Russian and Syrian officials—that according to the New York Times. Russia says that no members of the Russian armed forces were killed and that any Russians fighting alongside the Syrians were mercenaries. So what you need to know is that candidate Trump was clear when he pointed to the bush policy in Iraq and the Obama/Clinton policies in Libya and Syria that have only strengthened the creation and spread of ISIS and jihadism. Candidate Trump rightly pointed out that these policies had failed and that it was insanity to keep pursuing those policies and expecting a different outcome. So why is President Trump now embracing those insane policies that if continued will undoubtedly leave another power vacuum in the Middle East which will be filled with jihadis? This article was originally published on Truth in Media.